A hearty vegetarian meal to enjoy during Passover. From bourekas to pastelito (miniature pies), many Sephardi Jewish communities maintain a deep affection for savory pastries. But on Passover, the options for baking are limited by the weeklong prohibition of hametz — foods made from wheat, rye, barley, spelt, or oats. 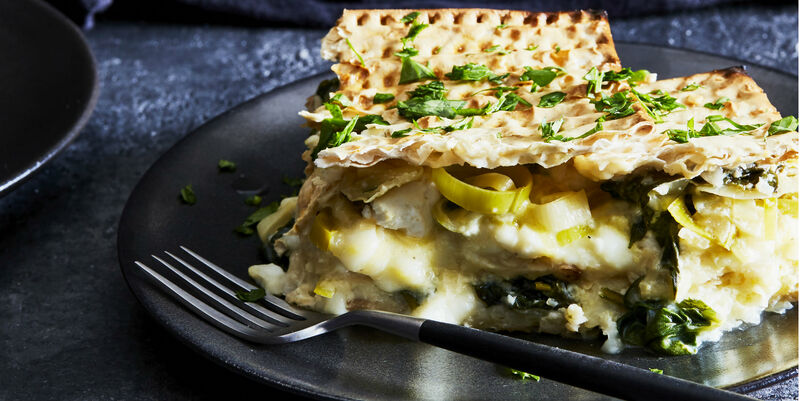 Enter this matzah pie, or mina, a free-form pie that is typically layered with spiced meat and vegetables or, as it is here, with spinach and feta cheese. Brightened with lemon zest and a burst of fresh oregano, this take on mina has all the briny fresh flavor of a boureka. Serve it as the main dish for a vegetarian or pescatarian seder meal, or at any dinner throughout the holiday. Reprinted from Little Book of Jewish Feasts by Leah Koenig with permission by Chronicle Books, 2018. Melt the butter in a large skillet set over medium heat. Add the leeks, shallots, and a pinch of salt and cook, stirring occasionally, until softened, about 10 minutes. Add the spinach, garlic, and oregano and continue cooking until the spinach wilts, 2 to 3 minutes. Remove from the heat and let cool slightly. Whisk together the cottage cheese, 3 of the eggs, the milk, feta, lemon zest, 1/2 tsp salt, and a generous amount of pepper in a medium bowl. Preheat the oven to 350°F [180°C] and rub a little butter around the bottom and sides of a 9-by-13 in [23-by-33 cm] baking dish. Fill a second shallow baking dish with warm water and dip in 3 sheets of matzah. Let the matzah soften for 2 to 3 minutes. Shake off the excess water and arrange the matzah sheets in the bottom of the prepared baking dish. Break the third matzah, if necessary, to fit it into the dish. Cover with approximately half of the cheese mixture, followed by half of the leek and spinach mixture. Repeat the process with 3 more softened matzah sheets and the remaining cheese and spinach mixtures. Soften the remaining 3 sheets of matzah and arrange on the top. Whisk the remaining egg in a small bowl and brush generously over the top of the matzah. Bake until golden brown and bubbling, about 45 minutes. Remove from the oven and let stand for 10 minutes. Serve warm, sprinkled with parsley. Store leftovers, covered, in the fridge for up to four days.